I have read his book, “The Lexus and the Olive Tree” recommended to me by a friend Mudit M. Maheshwari (where are you, btw ? ). I hope he googles himself some day, comes to this site and writes to me. ! 43b5, originally uploaded by harindertakhar. March 18th was the date when this cake was presented to me in the evening. Ah yes, I remember now – we watched Ray at PVR Saket – the last show, I think. Want to see the world?, originally uploaded by harindertakhar. 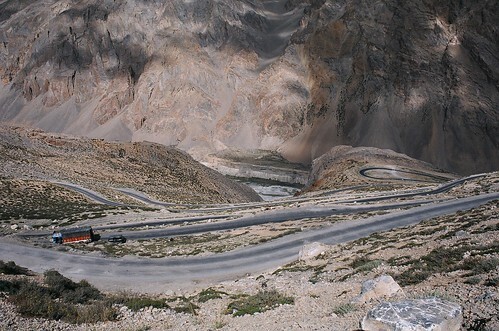 The above is a photograph of a site on the way to Leh via Manali. This set of bends is named the “21 Gata Loops”. These 21 bends climb up one side of the mountain to reach the top. 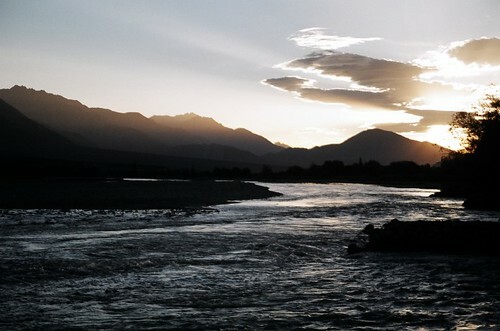 The route to Leh is amazing and time and again I will keep uploading these photos to inspire you all to visit Leh. Sometime back, I described my trip to Leh all over again to my cousin, Paru.He is inspired, and he wants to make it to Leh this year in June when the snow clears up! Who knows, even I might go with him again. 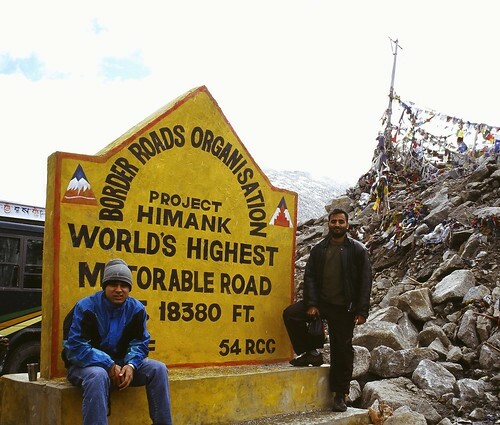 Today, the news said that they had cleared Khardung-La, the highest motorable road in the world. Check out one photograph below. Click on the photo to view any other size. Leaders / Managers, originally uploaded by harindertakhar. Good managers are capable of tracking the activities of their respective areas of responsibilities; are good at planning, budgeting, evaluating and facilitating their team and its resources. They use the resources they have to their fullest, and regularly discover new ways to get the most out of what they already have. A lovely article by Nandan Nilekani. Movie Review: Bunty aur Babli, originally uploaded by harindertakhar. Spoiler warning: There is no real suspense in the movie, but I feel I should get it off my head before I start: In case you would not like to hear the movie story before seeing it, don’t read ahead. I have heard some negative reviews over Bunty aur Babli from some people and I am amazed at how they could do so. I absolutely loved the movie and it has been a long time since I have experienced such wonderful wholesome entertainment. a) In the item song titled “chal baliye“, rani is shown wearing a strapless blouse. Well, in some shots when you look close enough, you will notice that the strap is there – a transparent one. It is edited-out in all shots where she is steady. b) Ranis’ hair in the first song, “dhadak dhadak”, is far from settled – AND I love that about her. That picturisation is just so perfect and blends so well with the character. The most beautiful part about Rani is that despite the gyrations and ample breast-shaking routines in that song – she does not look like a model in a remix video. She is as graceful as ever. To my mind, I could think of her as 21 year old. The haphazard hair is just as beautiful. Oh, I must be in love with her. c) Yes, she can lose some more weight. But is that a bothering issue? No. definitely not. She does it well in all her scenes – including the item number where she wears some kind of tight black leather shorts. And no – she still does not look like a remix video model. Aishwarya Rai, ofcourse looks classy in her item song. And one can’t help comparing her stomach to Ranis’. Aishwarya wins. But rani is so much more loveable that she beats Aish hands own in the brains-with-beauty department. d) When Rani acts pregnant, she looks even more beautiful. Now, this is where I feel I can not imagine Aishwarya Rai to be! To click this picture, I walked some 10 kilometers. I never had a clue I how I would, but I just wanted to reach by the river that I could see from a distance. The name of the place is Choglamsaar.